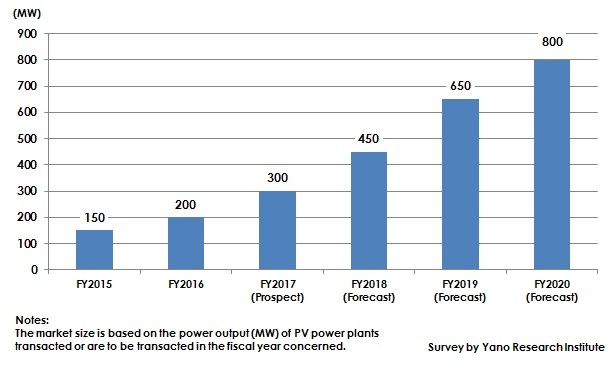 Yano Research Institute (the President, Takashi Mizukoshi) has conducted a survey on the domestic solar power plant secondary market and has clarified the trends of the market players and the service development, as well as the future outlook. The new projects of PV (Photovoltaic) power plants that come onto the market have decreased in Japan, because of lower sales price of electric power based on the FIT scheme and decrease in lands appropriate for power plant operation. However, those PV power plants, planned after the FIT scheme launched in July 2012, have started their operations one after another almost every year. With an inventory of PV power plants increasing, the secondary market of such PV power plant projects has begun being formed as a new market. This market transacts PV power plant assets that have already been in operation, so that it can be said as a second-hand market of solar power plant assets. The solar power plant secondary market size, based on the power output (MW) of PV power plants transacted or are to be transacted in the fiscal year concerned, is expected to attain 200MW in FY2016. This figure is likely to grow to 150% on year-to-year basis to attain 300MW by FY2017. Up until now, those PV power plants with each of their power output around some tens of megawatts have been transacted. Those market players eager to transact the already-operated solar power plants are: Power plant companies, financial institutions, institutional investors, infrastructure funds, and etc. Simultaneous with the expansion of the secondary market of PV projects, the services for supporting the transaction of existing PV power plants have been developed. Such services include: those that go between the seller and the buyer, assess the solar plants from the technological point of view, assess the asset value of the plants, and etc. EPC (Engineering, Procurement, and Construction) companies of PV power plants and O&M (Operation and Maintenance) service providers, financial institutions, and etc. have begun providing such services. While the secondary market of solar power plants has begun paid attention, importance of inspection and maintenance services for maintaining and/or improving the value of such solar power plants has become higher. Some O&M service providers have started some repairing services in addition to improvement of the existing inspection and maintenance services, in anticipation of future expansion of the solar power plant secondary market. With regard to transactions of solar power plants already in operation, the buyers are looking for the plants with a certain level of power generation capacity and favorable conditions in the facilities, as well as reasonable price. On the other hand, the sellers aim to sell the plants as good a price condition as possible. The price will be set based on the assessment of the value of PV power plants which is affected by the performance of power generated and the status of how the facility had gone through problems, if any. Therefore, it is important for the power plants to demonstrate their maximum abilities in power generation while keeping their facilities satisfactory. Those solar power plants located outdoors have some risks such as intrusions by birds and animals, and various weather conditions. Though there may have been no problem at the time when the operation was started, some troubles may occur to the components of the facilities as the time goes by, such as malfunction or deterioration in solar panels, power conditioners, and etc. Such a problem that directly affects the performance of power generation can deteriorate the assessment for the power plant transactions. Therefore, the faster the better to detect and solve such a problem. If a PV power plant has been significantly damaged by a large-scale disaster, it may be required to take measures to recover its asset values through repair works as needed. The solar power plant secondary market size, based on the power output (MW) of PV power plants transacted or are planned to be transacted in the fiscal year concerned, is expected to attain 450MW by FY2018, and 800MW by FY2020. Purchasing of PV power plants already operated has kept on taken place primarily by newly entered power companies and investors. When considering the increasing demand at buyers’ side, there may be some more owners and power companies who may become interested in selling their PV power plants. Increase of an inventory of PV power plants leads to increase of PV power plant properties, contributing to market expansion. Those solar power plants with their business plans certified at the early stages after the FIT scheme being in effect have better price conditions to sell power than those certified later, so that they are considered to attract more investors. With regard to those solar power plants that need less costs for operation and administration, newly entered power companies are considered to show their interest. Simultaneously, the demands of the services to support the transactions of PV power plants already in operation, such as going between the seller and the buyer, conducting due diligence, assessing the asset values, are likely to increase. In addition to the services mentioned, such repairing services to improve the asset values of solar power plants may attract attention. If the services to support the transactions of PV power plants expand, the competition is projected to be fiercer, with more companies likely to newly enter the market. Among the market players, those considered to largely affect the secondary market of PV projects in the future are infrastructure funds. Infrastructure funds invest in infrastructure and facilities, such as power plants, and distribute capital gains to investors. More infrastructure funds are expected to invest in existing PV power plants already operated, now that fewer new PV projects come onto the market. What is the PV (Solar) Power Plant Secondary Market? The PV (Solar) power plant secondary market in this research indicates the market to transact solar power plants already in operation. The market size is based on the capacity of power generation output of the PV power plants which are in operation and have been transacted or are to be transacted in the fiscal year concerned. Note that the market size calculated in this research does not include the transactions of the PV power plants that have not yet been operated.